2018 New Tata Tigor Facelift India Launch: Express Drives is at the launch event. Besides design upgrades, new Tigor facelift also features the largest touchscreen infotainment system in the segment. More details follow. 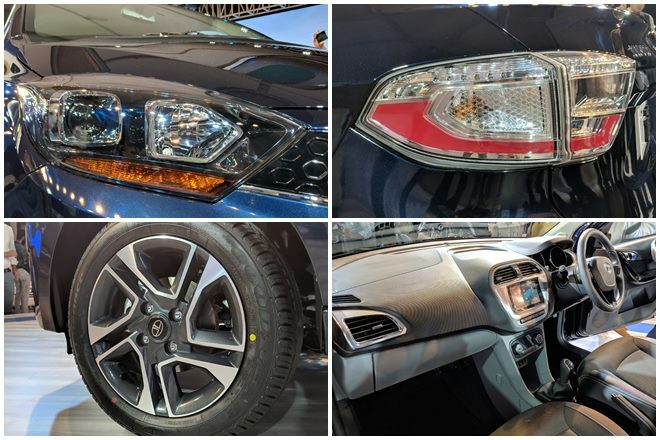 New Tata Tigor Facelift 2018 India Launch Highlights: Tigor facelift has been launched in our market boasting of several exterior and interior changes. The new Tigor now comes with six colour options along with projector headlamps and crystal-inspired tail lamps. Competing with the likes of newly launched Ford Aspire facelift and Maruti Suzuki Dzire, Tata Tigor facelift has starting price tag of Rs 5.20 lakh (ex-showroom). It comes with the same engine options with an optional AMT gearbox in the petrol trim. The new Tigor has also been updated on the inside with a new and bigger infotainment system. Tata Motors has said it will be making a big announcement on its brand new Tata Harrier SUV on 15th October. Alpha and Omega architecture will see 12-14 different vehicles which will boast of different drive terrain solutions in the next 5-6 years. Tata Tigor facelift has been launched at Rs 5.20 lakh for the petrol trim and the starting price of the diesel variants starts at Rs 6.09 lakh. 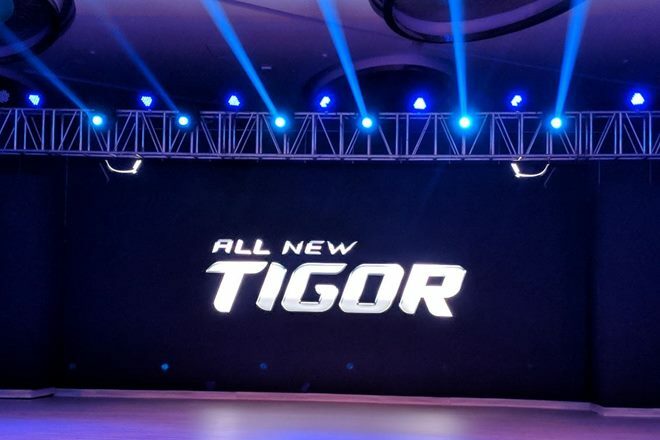 besides the Tigor, Tata Motors has also confirmed that there are more big announcements coming up on 15th October. Here it is. The new Tata Tigor facelift has been rolled out. It will be available in four variants and six colour options. Hrithik Roshan is the new star 🌟 brand ambassador for Tata Tigor. Tata Motors has a lot planned for this year and the next. Tata Tiago JTP and Tigor JTP are also to launch in 2018. Developed in collaboration with Jayem Automotive, the souped-up Tiago JTP and Tigor JTP will be performance editions of the hatchback and compact sedan. Besides these, Tata Motors will also launch a brand new SUV - Tata Harrier - in early months of 2019. Tata Tigor facelift will be available in four variants and six colour options. The base price of the Tigor facelift is Rs 5.20 lakh (ex-showroom) and extends to Rs 7.38 lakh (ex-showroom). It has been updated with new design features on the outside and a new infotainment system and upholstery on the inside. The powertrain options remain the same. The Tigor facelift competes with Ford Aspire facelift and Maruti Suzuki Aspire. 2018 Tata Tigor facelift now features projector headlamps, new tail lamps, and new ORVMs. 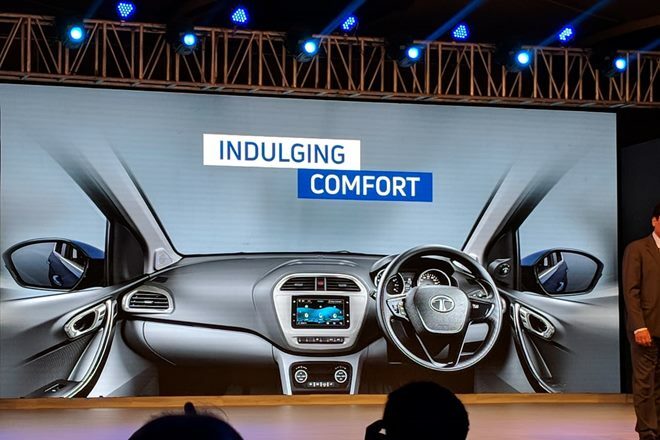 On the inside, the new Tigor facelift features a new infotainment system that has been borrowed from Tata Nexon and is the largest in the segment. The new 2018 Tata Tigor facelift has been updated with redesigned bumpers, projector headlamps, and new tail lamps as well. On the inside, the Tigor now boasts of a new infotainment system that has been borrowed from Tata Nexon. The 7-inch touchscreen system is the largest in the segment and also supports Android Auto. New Tata Tigor facelift will be available with the same engine options - a 1.2-litre Revotron petrol and a 1.05-litre Revotorq diesel engine. Both engines come paired with a five-speed manual gearbox with an optional AMT on the petrol trim. New Tata Tigor facelift will come with a new diamond grille, projector headlamps, 15-inch alloy wheels, and crystal-inspired tail lamps. In the last five years, the per capita income has gone up by 50% that has seen entry-level sedan segment sales going up. The segment now accounts for 60% of first-time buyers. Hatchback with a box for a boot is no longer enough. The new age buyer needs a sedan that looks and drives like a sedan, Pareek continues. Tata Motors has registered a growth of 31% as against industry growth of 7%. Tata Tigor facelift launch event has started with President Tata Motors Mayank Pareek taking the stage. Four new products have been planned for this festive season. Tiago NRG has helped the Tiago brand numbers to go up significantly. There is Tata Hexa special edition, then Nexon Kraz and now new Tigor. 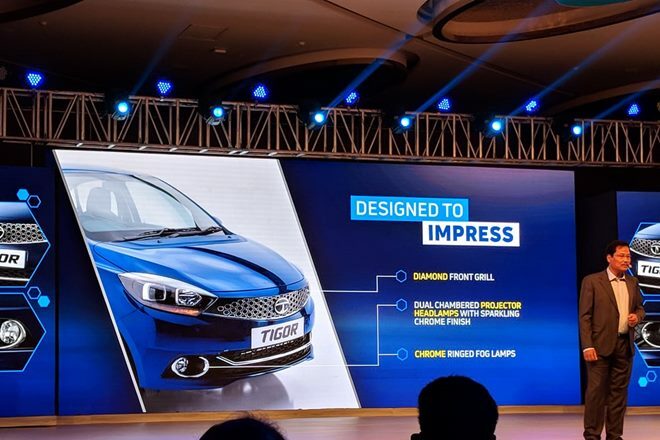 With Ford Aspire facelift being launched in India at a starting price of Rs 5.55 lakh (ex-showroom), we well soon find out if Tata Motors will be able to undercut its pricing with the new Tigor facelift. While the current Tigor is priced at Rs 5.16 lakh (ex-showroom), expect the new facelift version to be about Rs 15,000 higher. Just a few days ago, Tata Motors signed Bollywood celebrity and popular actor Hrithik Roshan as its new brand ambassador before the launch of the new Tata Tigor facelift. Tata Motors earlier signed footballer star Lionel Messi to represent its Tiago (Zica) brand and Akshay Kumar endorse Tata Motors' Commercial Vehicles Business. The new Tata Tigor facelift will feature a larger touchscreen infotainment system. It will be the same 6.5-inch unit that comes equipped on the Tata Nexon. The new infotainment system supports smartphone connectivity through Android Auto and Apple CarPlay. 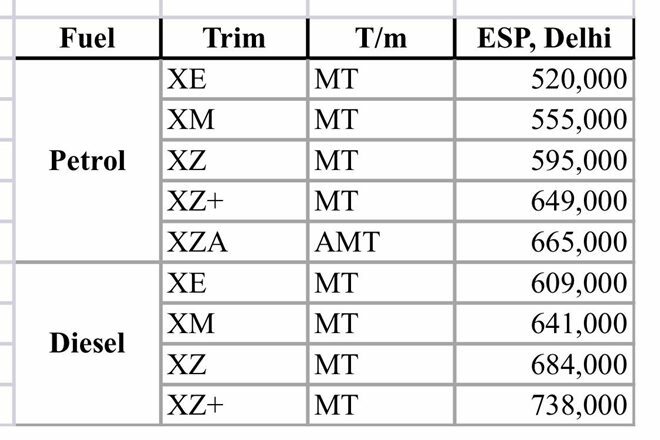 Besides these feature updates, the new Tigor facelift is also likely to be updated with new upholstery. 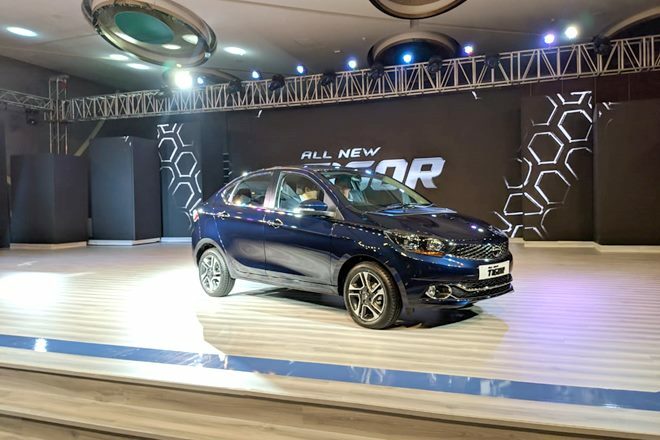 Besides the updates to the headlamps and tail lamps, new Tata Tigor facelift will come with redesigned bumpers for a fresh look, along with a new blue colour option. The new Tigor will also boast of new interior features. New Tata Tigor facelift is expected to remain the same under the bonnet. It will come with the same engine options of a 1.2-litre Revotron petrol and a 1.05-litre Revotorq diesel engine. Both engines come paired with a five-speed manual gearbox with an optional AMT on the petrol trim. The stage is set for the rollout of the new Tata Tigor facelift. 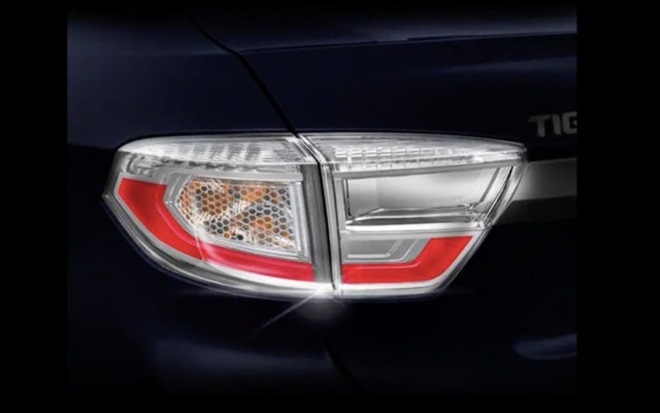 Tata Motors recently released a teaser video of the new Tigor which shows that it will feature projector headlamps and new crystal inspired clear lens tail lamps. Based on the teaser video, we also know the new Tigor will be available in a new colour option. Global wholesales of all Tata Motors’ commercial vehicles and Tata Daewoo range in September 2018 were at 52,018 units, registering a 25%, growth over September 2017. Global wholesales of all passenger vehicles in September 2018 were at 71,559 units, lower by 4%, compared to September 2017. But while Tata Motors prepares the star of the day backstage, here's what the company has been up to lately. 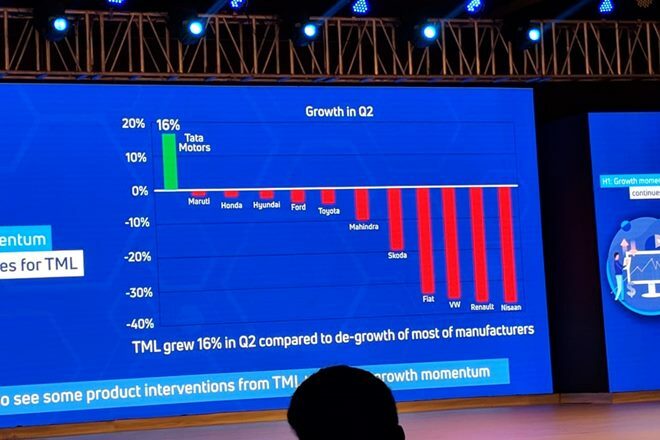 Tata Motors Group global wholesales in September 2018, including Jaguar Land Rover, stood at 1,23,577 units, which is a 6% growth compared to September 2017. We are at the new Tata Tigor facelift launch event to bring you details live from the venue. 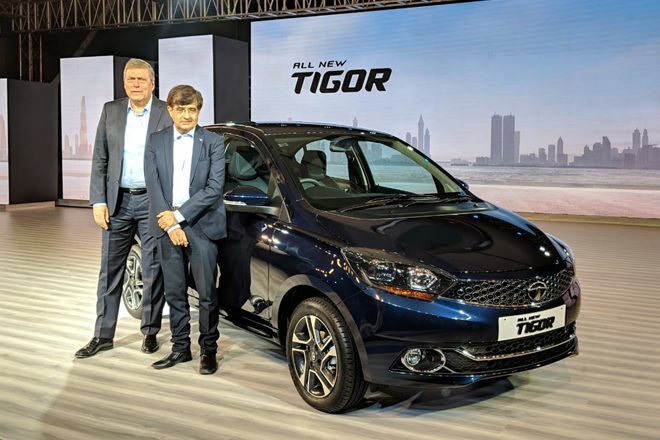 One of the most successful Tata Motors' products, Tata Tigor is now all set to receive a design and interior upgrade which includes features that will render the Tigor more premium than before. New Tata Tigor facelift is priced at Rs 5.20 lakh (ex-showroom), which is merely Rs 4000 than the older version which retailed at Rs 5.16 lakh.